Kumiko Kumazawa of Pilot Corporation placed four fountain pens in front of me. “Try them and tell me the difference,” she said with a smile. 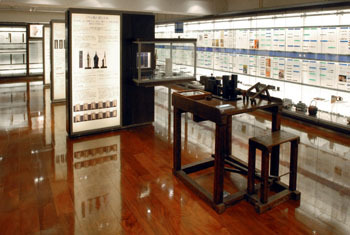 I am sitting at the counter of Pen Station, a museum of writing-related items in Kyobashi, Tokyo, that’s run by Pilot, Japan’s oldest maker of fountain pens. One by one I tried out the four pens — one silver, one red, one blue and one with a transparent body. And yes, their touches were definitely different. It felt like the nib was scratching the paper more when I wrote with the transparent pen, and the lines of the letters looked thinner than the others. The red-bodied pen was very smooth and the nib seemed to deliver more ink. I said as much to Kumazawa — who told me that I was wrong, and that all the pens had the same size nib. She went on to tell me that the metal nib of a fountain pen changes according to its user’s writing style — so that, over time, it becomes entirely personalized. Therein lies the unique feature of fountain pens that differentiates them from workaday ballpoints — let alone pencils. Also, ballpoints are in their best condition when they are brand new, whereas fountain pens get better the more you use them, Toshifumi Iijima, another of the museum’s staff explained. “Fountain pens grow; that’s the right expression, perhaps,” he said. 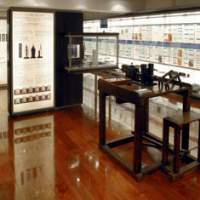 To better present the numerous features and the fascinating history of writing materials, and especially of fountain pens, Pilot opened the museum in 2002, and it now showcases about 400 items, including 300 fountain pens. Most eye-catching among the displays is an exhibit of about 40 maki-e (literally, “sprinkled picture”) fountain pens, each with a unique body exquisitely decorated by artists in Japanese lacquer. If they were to be sold, they might well be priced at more than 1 million yen each, Iijima said — although as they are art works for display, not retail items, he said that was pure conjecture. 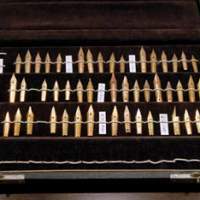 In general, however, he said that “the history of the development of fountain pens is the history of the development of ways of keeping ink in the body of the pen,” rather than dipping a nib in the liquid. Of course, when cartridges were developed about 50 years ago, that was a dramatic landmark in fountain pen development, he added. But still, some fountain pen lovers say they far prefer the old-style, more delicate designs with rubber bladders inside that the user has to squeeze by hand to draw in the ink, he said. Whatever vintage of fountain pen you may prefer, though, at the end of my visit the key word I was left with was “personal” — not only because a fountain pen will over time change to suit your writing style, but because — unlike a typewriter or a keyboard — it will reflect your moods and feelings in the actual form of your writing, not just through what you write. 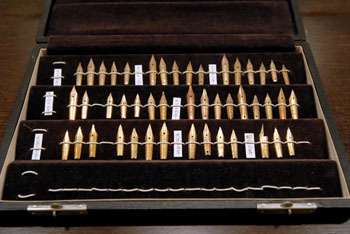 Finally, as I was leaving, I asked the museum staff to answer a few practical questions for anyone thinking about taking their old fountain pen out of their desk drawer again, or going out to buy one for the first time — at prices that start from as little as a few hundred yen. * What’s the secret of writing beautifully with a fountain pen? Write more often. Get used to it. * How different is writing done with a fountain pen from writing with any other instrument? A fountain pen represents your state of mind better, because the nib springs slightly as you write. So that means your writing will look different if you are angry or relaxed or whatever. * Is it difficult to take good care of a fountain pen? Probably at the end of year, you have more chances to write greeting cards using a fountain pen. However, if you aren’t going to use your pen for a while, you are recommended to wash the nib in water before putting it away. Otherwise, ink may dry hard and make it more difficult to clean later when you want to use it again.